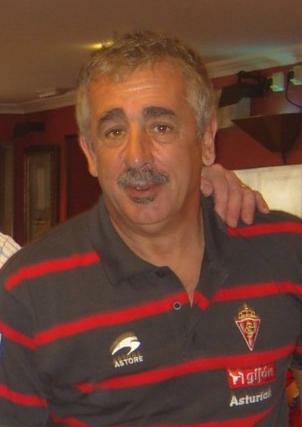 The news of Manolo Preciado’s passing was one that shocked the football community in Spain and abroad. His demeanor as well as his ability to fight for people made him a favorite of many. Players fought for him and played for him without any doubt. He was just that type of coach, he was also that type of person. He was a man that always wanted to be happy; but he knew when he had to put his foot down to assert himself. Many colleagues and former players looked at him and admired him. A man that was the salt of the earth. He did not take bigger offers in an effort to stay at Sporting and give his family stability as well as be near his parents. To him football wasn’t a battle. To him football was an escape from the battles that he had to tend to in his personal life. The battles that he fought meant more than goals and wins and losses and the adulation or criticism of masses. His battles were the ones that saw him teetering on the edge of oblivion. His spiritual strength was shown when he first arrived to Gijón to take over a squad that was struggling in the second division and looked to “bring joy” to the club. He preached positivity during that time and the players that he led onto the pitch every week knew that what he was saying was not just coach-speak or rhetoric. This is what helped Sporting Gijón reach achieve promotion back in 2008. It was about being positive and focused. This was his “secret”and “Manolín”, as many knew him as, became a club legend. He admitted years later, that the ambience in the press room the day he was being presented made him say that. He admitted that he was speaking from the only place he’s been able to speak from- his heart. Honesty was his greatest policy. He was a battler. A very combative person, but that was his nature. His honesty allwed him to never fearing of what more powerful people said of him. Just ask Jose Mourinho, who after losing to Barcelona questioned his professionalism after he fielded a team filled with backups. ”He’s a coward,” Preciado fired back. That was just the way he was. If Manolo Preciado would have been a boxer, he would have been one of those that kept going straight ahead and never held anything back. Although, he was very regretful of that episode of his career. This was part of the reason he was left out of Racing Santander back in the mid 70′s, after being captain there, as he was looking to fight for social security benefits and was accused of being a “union organizer”. He mentioned that the experience was a bad one, but it was like when “your girlfriend leaves you,” he said in an interview. ”You are dumbfounded for like a month and then you find yourself a new one and it’s as if nothing happened.” That was also something that helped him overcome his adversities- his humor. Whether it was that experience or the one where he was relieved of his duties as coach of his beloved club two decades later by Dmitry Pietrman, he took it all in stride. That was the way his life was. That was the way he confronted the hand he was dealt. Manolo was dealt a difficult hand. at 42, he became a widower after his wife would die after her battle with cancer. It was a bitter pill to swallow. Then his 15-year-old son would die in a motorcycle accident and his life would be devastated. Just last year, his father died after being rolled over by the car that he was pushing. Mourinho was one of the first people to send his condolences. Ironically, it was Mourinho himself the one that had the most emotional words for Preciado. In Real Madrid’s website, the Portuguese coach left some words that allowed him to express himself about a man that he competed against and would eventually become friends with him. Preciado headed to Valdebebas at one point to “learn” what Mourinho had to “teach”. Preciado left a very important imprint at all the clubs he coached. More importantly, he left an example that inspired many individuals, especially in his new home in Gijón. He always said he was a Racing fan, but his time at Sporting made him just as Asturian as the rest of the Sporting fans. He helped turn a culture of apathy at Sporting to becoming one of the best traveling sides in all of Spain. That, plus helping that club go up to the first division made him an icon. More importantly, as a person he was one that inspired many in the game. Although there were many time he broke down players, he would use that as a way to buld them back up. This is why players had an affinity towards him. He was one that was very close to his players. Manolo was a coach that would not police his player and in some cases fraternize with them whenever he could. He understood that players have a short shelf life and he wanted to be a guide to many of them. He also wanted to be there for them for when the cheers as no longer heard. Manolo knew this well as he was buying and selling all types of trinkets during the period of time where he was recently making the transition from playing into coaching. He kept it real, that was all. That’s why various players appreciated his company. He always talked about being surrounded by people and needing people in order to work well and enjoy what . He wanted to feel loved and he want to be a part of something. Little did he know that people thought they he was a part of their lives and he changed theirs in many aspects. His brilliance and his human qualities were such that he was a teacher, a role model, a civic icon and- most importantly- he’s a winner in the game of life. It was that attitude that made him a true leader of men and helped somewhat heal the scars of his past. His attitude was what helped him accept the tragedy in his life and make it a positive in his life where he was able to reach the prominence he did. No awards can ever equal that type of legacy and impact that a person can have in this world. To me that is the sign of a true winner.